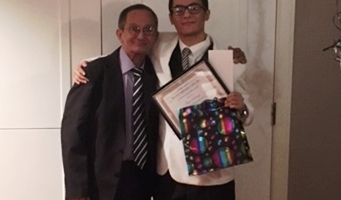 New Horizons senior and JAG student Juan Santiago received a scholarship from WeCare Community Center, Inc. Saturday night. Juan joined my JAG class mid year and has been a positive influence among peers. He upholds and exhibits JAG’s values on a daily basis and I was very happy to assist him with this scholarship application. This scholarship was created to inspire youth to work hard both in school and out. WeCare encourages young people to apply what they’ve learned to make positive impacts on their community. Requirements for the scholarship included a minimum of 2.50 GPA, a graduating High School Senior attending community college or university and an essay explaining how you have helped your community. Juan was more than qualified. WeCare, founded in 1997, believes that education can transform the lives of youth and young adults and prepares them for professional careers. Juan will be attending Gateway Community College in the fall of 2016 and hopes to become a CPA in his future. Great job, Juan! 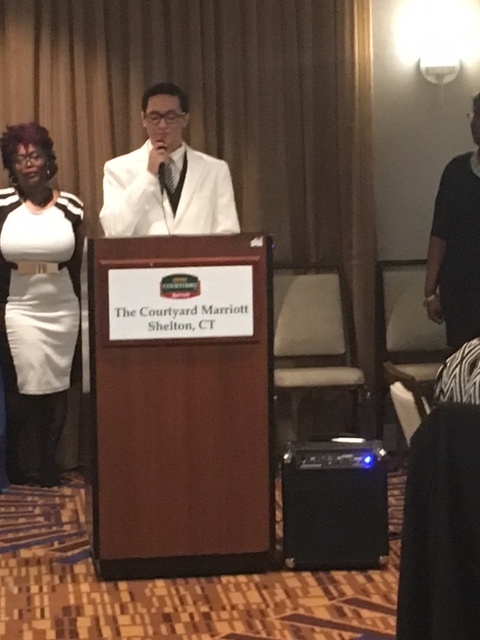 Juan is seen here accepting his scholarship with WeCare secretary, Dawn Smith. He is pictured with his father, Miguel.